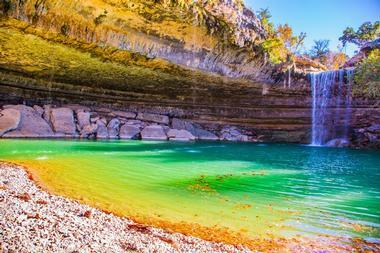 You don't need to go very far to find stunning natural beauty in the United States, but some places are just magical. The country is approximately 3.8 million square miles in size, so it should come as no surprise that it's home to some spectacular scenery, but sights like the Grand Canyon, the Mendenhall Ice Caves, and the soaring peaks of the Smoky Mountains never fail to meet even the highest expectations. 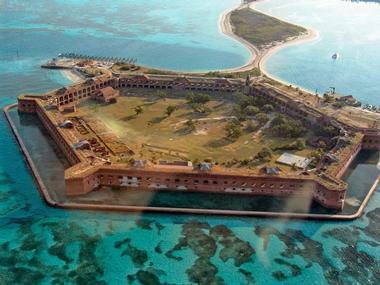 Traveling abroad is always worthwhile, but before you hop on a plane to a different country, consider visiting one of these incredible national landmarks instead. 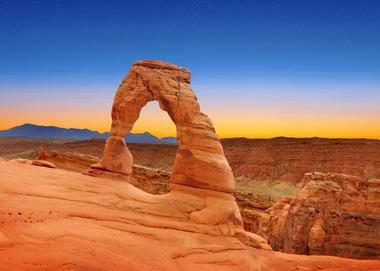 Home to more than 2,000 natural stone arches, Arches National Park boasts a higher density of natural arches than anywhere else in the world. 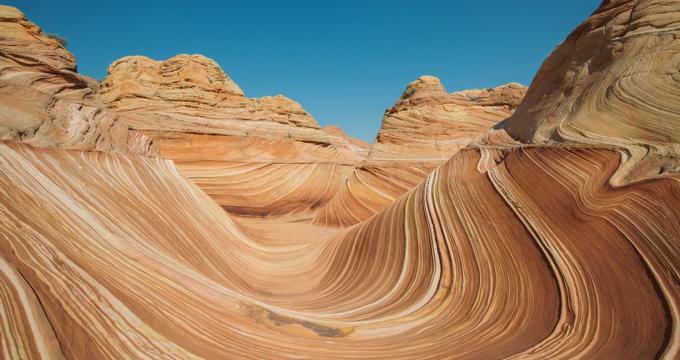 The park is located right next to the Colorado River in eastern Utah, and most visitors will spend at least some of their time here driving or cycling along the scenic 18-mile road that winds its way through the park. There are also a number of hiking trails that range from 15 minutes to 5 hours, and ranger-led tours are offered during the spring, summer, and fall. Rock climbing is permitted on select routes. 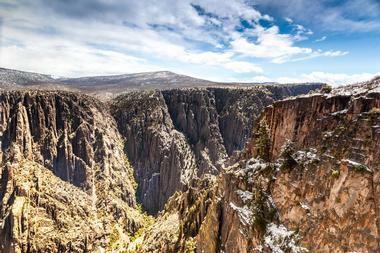 Carved out by the Gunnison River over the course of two million years, the Black Canyon of Gunnison boasts some of the steepest and most majestic cliffs and rock spires in North America. Hiking trails suitable for most ages and abilities can be found along both the north and south rims of the canyon, and individuals in excellent physical shape might be tempted to try one of the extremely strenuous trails that lead down into the inner canyon. Other possible activities here include rock climbing, wildlife watching, kayaking, and fishing in the beautiful river that runs through the canyon. 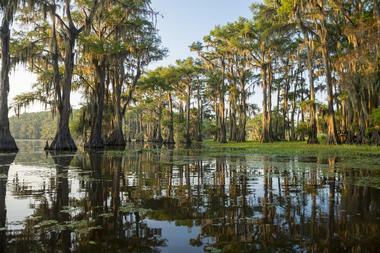 Straddling the border between Texas and Louisiana, Caddo Lake is an excellent place to boat, fish, canoe, and hunt for geocaches. More than 70 different species of fish can be found in the lake, and canoes and fishing equipment are available for rent in the park. There's enough here to keep visitors entertained for days, and overnight accommodation is available in the form of 46 campsites and several historical cabins. The lake also boasts one of the largest flooded cypress forests in America; shrouded with Spanish moss, the trees create an eerie atmosphere and can make for some truly stunning photos. 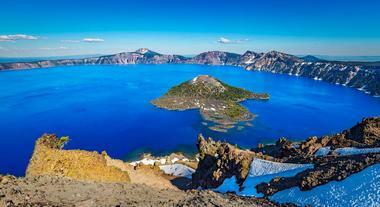 Located in south-central Oregon, Crater Lake was formed by the collapse of a large volcano approximately 7,700 years ago. The lake is fed entirely by rain and snow, making it one of the least-polluted bodies of water in the world. With a depth of 1,943 feet, it is the deepest lake in the United States and the third deepest in the world. The water is known for being a wonderfully intense shade of blue, and the park is also home to a number of interesting volcanic features, including a cinder cone known as Wizard Island, which rises up from the center of the lake. World-famous Denali National Park is best known for being home to the 20,310-foot Denali Peak, North America's tallest mountain. The first known ascent of the mountain occurred in 1913, and since then, the challenging peak has attracted mountaineers from all over the world. 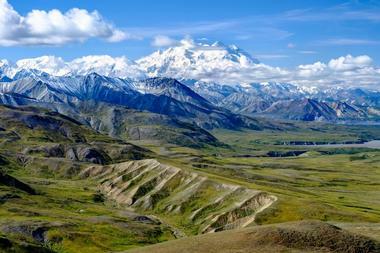 All climbers must register with the Denali National Park and Preserve at least 60 days before they attempt the ascent, but even getting the chance to see the peak is a highlight of the park for most visitors. Only one road goes through the park; visitors can choose to drive themselves or take one of the many available buses. 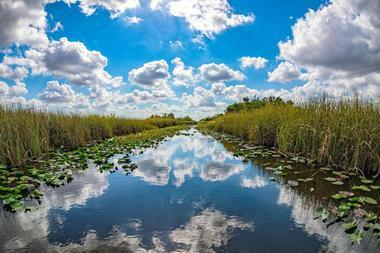 Encompassing 1.5 million acres of wetland on the southern tip of Florida, Everglades National Park consists of mangrove forests, sawgrass marshes, and pine flatwoods. An incredibly diverse array of flora and fauna can be found here; highlights include the endangered leatherback turtle and the West Indian manatee. The park can be accessed through Miami, Everglades City, or Homestead, and park permits can be purchased at any of the entrances. A variety of ranger-led programs are offered during the wet season, which lasts from April to November and is the best time to visit the park. 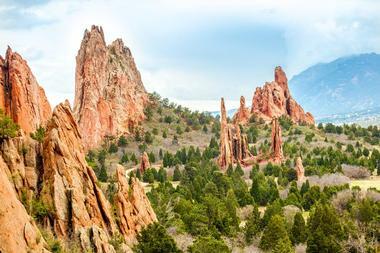 Situated in the heart of Colorado Springs, the Garden of the Gods has been a National Natural Landmark since 1971. The park offers more than 15 miles of hiking, cycling, and horseback riding trails, including a paved 1.5-mile trail that runs right through the center of the park. Other popular activities here include technical rock climbing, taking Segway or Jeep tours, and learning about the history of park through the many educational interactive exhibits that can be found in the visitor and nature center. The park is open to visitors free of charge, and hours of operation vary depending on the season. Often referred to as the Crown of the Continent, Glacier National Park in Montana is home to the headwaters for streams that flow as far away as the Gulf of Mexico. 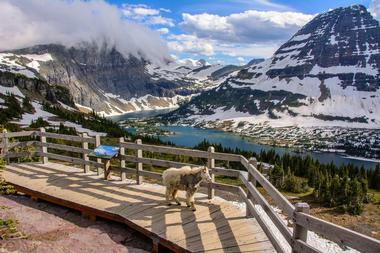 No visit to the park is complete without a drive down the Going-to-the-Sun road, which connects the east and west sides of the park, but there are also more than 700 miles of trails for visitors to take advantage of. In addition to its excellent hiking opportunities, the park is also an great destination for anyone interested in fishing, biking, boating, or spending a night or two in a beautiful, remote campground. The Grand Canyon is easily one of the most distinguishable landmarks in the United States; stretching 277 miles through the Arizona desert, the colorful canyon is a true natural wonder that offers plenty of recreation activities. 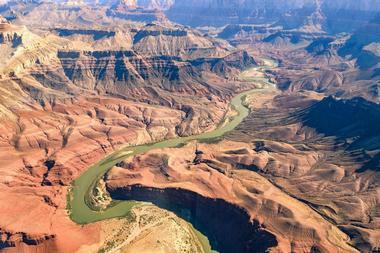 The canyon is divided into three areas: the South Rim, the North Rim, and the West Rim. Most visitors head to the well-developed South Rim, which is open all year round and offers a number of restaurant and lodging options. The West Rim is home to the glass-bottomed Skywalk, while the wild and remote North Rim is perfect for anyone wanting to spend some time relaxing away from the crowds. 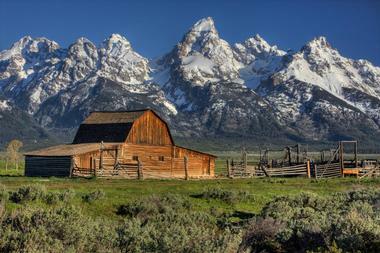 Part of the Rocky Mountain Range, the Grand Tetons are located in northwest Wyoming. The park boasts more than 200 miles of hiking trails, and there are almost endless opportunities to birdwatch, fish, climb, boat, and go cross-country skiing or snowshoeing in the winter. Six campgrounds can be found within the park, and backcountry camping is available to visitors who purchase a special permit. All visitors must purchase an entrance permit, which is valid for 7 days from the date of purchase and can be used for the John D. Rockefeller Jr. Memorial Parkway as well. Scientists aren't yet entirely sure how old the Great Sand Dunes are, but they are known to be the tallest dunes in North America. 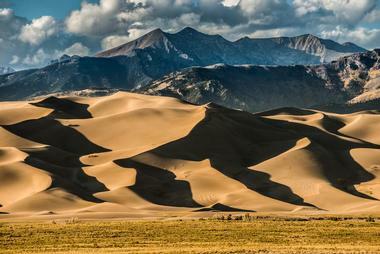 The tallest dune here stands 750 feet tall; known as Star Dune, the massive dune takes approximately 5 hours to summit. If you have even more time to spend in the park, you can get a free backcountry camping permit and pitch a tent anywhere outside of the day use area. Adventurous visitors can also try their hand at sand sledding or sand boarding down the dunes; gear can be rented from a kiosk right outside the front entrance. Named for the smoke-like fog that often shrouds their peaks, the Great Smoky Mountains straddle the border between North Carolina and Tennessee. 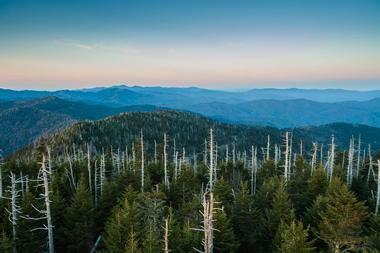 Most of the range is protected by the Great Smoky Mountains National Park, which was established in 1934 and is now the most visited national park in the country. Hiking is one of the most popular activities here; there are plenty of trails suitable for all fitness levels, many of which lead to sparkling waterfalls or spectacular views of the mountain scenery. Depending on the season, visitors can also fish, cycle, snowshoe, and marvel at the beautiful fall foliage or summer wildflowers. Created by the collapse of the dome of an underground river, the Hamilton Pool is just over 20 miles away from Austin, Texas. A 50-foot waterfall drops into the jade green pool, making it one of the most beautiful and most popular swimming spots in Texas. Swimming is permitted all year round as long as the bacteria levels in the pool are acceptable, but there is no lifeguard on duty and water temperatures get quite cold in the winter. Visitors must purchase a Travis County Park entrance pass, and reservations are required during the peak summer months of May through October. 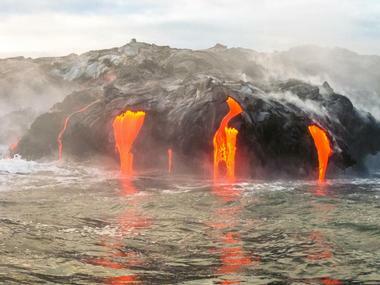 Established in 1916, the Hawaii Volcanoes National Park encompasses two giant volcanoes: Kilauea, one of the most active volcanoes in the world, and Mauna Loa, the world's biggest shield volcano. In addition to offering stunning volcanic scenery, the park is a refuge for some of the rarest flora and fauna in the world. The park can be explored by car or by foot; the most popular driving route is the 11-mile Crater Rim Drive, which circles the summit of Kilauea volcano, traverses the caldera floor, and provides access to a number of excellent short walks and scenic viewpoints. Carved out by the powerful Snake River, Hells Canyon is the deepest river gorge in North America – deeper than even the Grand Canyon. 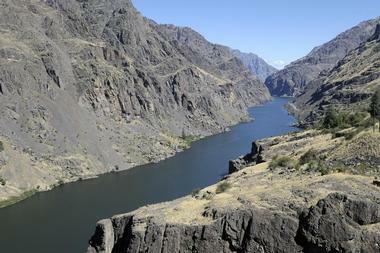 The easiest way to marvel at the canyon is by taking a drive along the Hells Canyon Scenic Byway, which winds its way along the east side of the massive gorge. Another excellent way to experience the beauty of the area is to take a guided float or jet boat trip along the Snake River, but there are also plenty of excellent hiking and biking trails for visitors who prefer to stay on dry land. Only 12 miles away from Alaska’s capital city of Juneau, the Mendenhall Ice Caves are formed by the meltwater running off the Mendenhall Glacier. 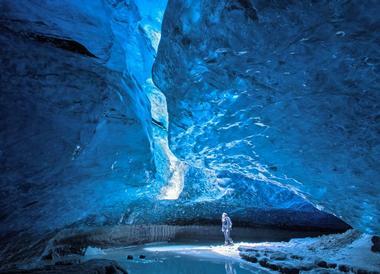 The bright blue caves are in a constant state of change; as the glacier recedes, the caves are gradually melting and collapsing, meaning that a visit here is truly a once-in-a-lifetime opportunity. Visitors are permitted to visit the caves on their own, but those unfamiliar with staying safe in a glacial environment are advised to take one of the many excellent guided tours available. A round-trip visit typically takes at least 8 hours, and proper safety equipment is essential. 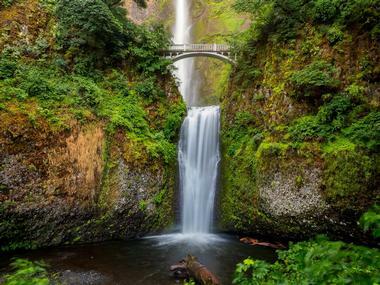 At 611 feet, Multnomah Falls is the tallest waterfall in Oregon and one of the only falls in the area that doesn't dry up in the late summer. Conveniently located only half an hour away from Portland, the three-tiered waterfall is only a 5-minute walk away from the parking lot. A second paved trail brings visitors up to a second viewpoint at Benson Bridge, and from here, visitors can choose to hike another mile to reach the very top of the falls. A gift shop, an information center, and a restaurant can be found in the historical Multnomah Falls Lodge. Straddling the border between the United States and Canada, Niagara Falls is made up of three different falls: Horseshoe Falls, American Falls, and Bridal Veil Falls. 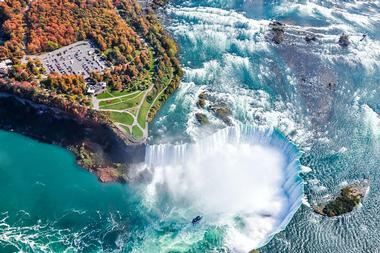 The American Falls can be viewed from walkways along Prospect Point Park, but visitors can get right underneath the falls by taking the famous Maid of the Mist boat tour or by hiking to the Cave of the Winds underneath Bridal Veil Falls. If you'd like to view the impressive falls from an entirely different angle, you can walk or drive across the border and view the falls from the Canadian side as well. Redwoods are the tallest trees on the planet, and the Redwood National and State Parks in California protect approximately 45% of all remaining coast redwood old-growth forests. The best way to experience the majesty of the redwoods is by foot; more than 200 miles of trails wind their way through the park, and there are options for people of every age and ability. Some trails are paved, but most are lined with compact gravel. Ranger-led programs are offered during the summer, and there are a number of scenic drives for those who prefer to view the redwoods from the comfort of their vehicle. 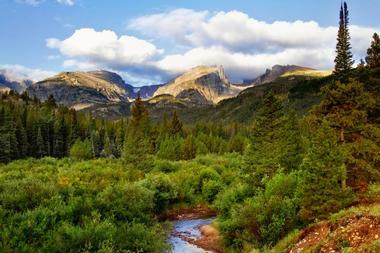 Spanning 415 square miles of spectacular mountain terrain in northern Colorado, the Rocky Mountain National Park is home to some of the most beautiful mountains in America. There are plenty of things to do in the park, no matter what the time of year; summer offers excellent hiking and camping opportunities, but winter brings the opportunity to cross-country ski, snowshoe, or sled in Hidden Valley. Visitors must purchase either a 1-day or 7-day pass at one of the park entrances, and a free shuttle bus service to some of the most popular hiking trails is available during the busy summer months. Covering a 65-mile stretch of Lake Michigan's coastline, Sleeping Bear Dunes National Lakeshore is best known for the immense sand dunes perched 400 feet above the lake. The area is a true paradise for nature lovers, and visitors can head up to the sandy bluffs to get excellent views of Lake Michigan, admire the views from the seat of a canoe on one of the many inland lakes, or even go scuba diving in the Manitou Passage Underwater Preserve. There are also campgrounds in the park for anyone who would like to spend the night, including several rustic sites on the Manitou Islands. 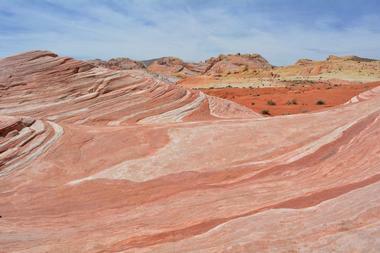 As its name implies, Valley of Fire State Park encompasses 40,000 acres of bright red Aztec sandstone formations. Other points of interest in the park include petrified trees and petroglyphs that date back more than 2,000 years; the visitor center offers a number of excellent exhibits on the history of these features. The visitor center is also happy to provide information about the many excellent day hikes and rock climbing spots in the area. There are three campgrounds in the park for visitors who would like to spend the night, and there are also several shaded picnic areas available for day use. 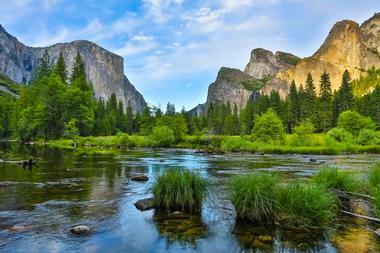 One of the oldest national parks in the United States, Yosemite National Park encompasses an astonishing array of natural beauty, including jewel-like subalpine lakes, ancient sequoia trees, spectacular waterfalls, and sky-scraping granite pinnacles. 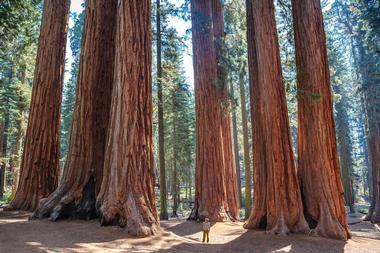 It would take years to thoroughly explore the entire park, but highlights include the sequoia trees in Mariposa Grove, the massive granite formation known as Half Dome, and the 2,425-foot Yosemite Falls, which is the highest waterfall in North America. There are 13 campgrounds and a good number of lodges in the park, and backcountry camping is permitted if reservations are made in advance. 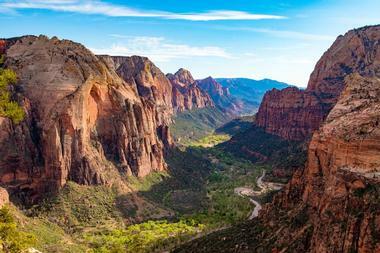 Thanks to its dramatic red sandstone cliffs, many scenic waterfalls, and a wide variety of outdoor activities, Zion National Park is the most popular park in Utah. The main feature of the park is the breathtaking Zion Canyon, but it's well worth taking the time to discover lesser known attractions like the Emerald Pools, the cliffs of Angel's Landing, and the tranquil Kolob Canyons as well. Parking is limited inside the park, but a free shuttle service to nine of the park's most popular attractions is available from the visitor center during the busy summer months.